U.S. Navy. Via Wikipedia Commons. Shimada Shigetaro graduated from Eta Jima in 1904 and was a Class A student at the Naval War College, graduating in December 1913. He served as naval attaché in Italy during the First World War. Between the wars he commanded battleship Hiei and held important staff positions, rising to the rank of full admiral. Young people are too optimistic. There is the problem of repairing warships, too, so ship construction probably will be 200,000 to 300,000 tons, about half. 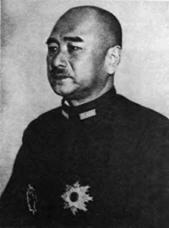 After the embarrassment of the Allied raids on Truk in mid-1944, Shimada relieved Nagano as chief of the Naval Staff while continuing to serve as Navy minister. He was forced out as Navy minister after the Marianas debacle, and was soon relieved as chief of the Naval Staff as well. He chose to retire on 20 January 1945. Shimada was charged by the Allies with 55 separate war crimes, but was convicted only of crimes against the peace. For this, he was sentenced to life in prison by the Tokyo tribunal, but he was released on account of ill health in 1955. He lived another twenty-one years. Shimada was very tall and devoutly religious. He drank little, smoked not at all, and was known to be devoted to his mother. Cautious by nature, he tried to please everyone and therefore stood up to no one, earning him the sobriquet within the Navy of Yurufun or "Droopy Drawers." After a newspaper published a photograph showing Shimada standing behind Tojo, the public began quietly speaking of him as Tojo's "tea servant." He was so deferential to Tojo's wishes that Admiral Okada, one of the Genro or elder statesman advising the Emperor, told Shimada that he had lost the respect of the Navy and should resign.